And I subscribed to their newsletter! Congratulations, gals. Please send us an email right away to claim your gift card. Thanks to all who entered, and thanks to William Riera for all the prettiness! Summer hasn’t even really started yet and already my calendar is filling up with special events. So much for the “lazy days.” Weddings, graduations, and all other manner of warm weather soirees require careful dressing. Just formal enough, but also comfy and flattering and, of course, gorgeous. William Riera USA wants to make sure you are dressed to thrill, so they are giving away two $50 gift cards this week to help you put together the perfect summer ensemble. Two winners! The hard part will be choosing from their beautiful dresses and fab accessories. Maybe you’ll choose the Jane, as shown on the model above. It’s probably my favorite out of the entire collection. I’d add a chunky colorful necklace and a pair of wedge sandals. Perfection. Or perhaps the Anne? That color is gorgeous. Put on some sparkly earrings and saucy heels, and turn some heads. Plus, a girl can never go wrong with a bit of ruching. Leave a comment on this post telling me where you’ll be wearing your new dress! Be sure to include an email address so we can contact you! For an extra entry, “Like” William Riera on Facebook. For a third entry, subscribe to their newsletter (bottom right corner of their page). Giveaway ends Wednesday, May 30th at midnight, MDT. Winner announced Thursday May 31st right here on this post. Extra good news for everyone: William Riera is kind enough to offer a discount code for our readers. Enter code petitelefant at checkout for 15% off any purchase from now until June 1st. I would wear my new dress to dinner with my husband. Our 9th anniversary is coming up this summer! Pretty much I’ll wear my dress anywhere! I love dresses! Mostly church and work though. I would wear the red one to a wedding! I have approximately four weddings this summer. It would be put to great use! I would wear it to my up an coming father/daugther dance this fall at college! Pair it with adorable accessaries. I would wear the dress to church and to my one year anniversary with my husband. Thanks for the giveaway!! I liked William Riera on facebook. I desperately need new wardrobe help for my new job as a real estate agent! The Athena would be just perfect! I would wear the dress to my confirmation in church, where my boyfriends parents are also meeting my family for the first time, it will be a great day, paired with a great dress to celebrate! I would wear it to my graduation ceremony (which is next month, eeep!). …aaaand i liked them on facebook. C’mon random number generator. Pick me! I heart that Jane dress! I would wear Anne on date night! Love it. I’d love to wear a new dress for my company portrait that I have to have made. I’ll check this out and “like” them on facebook, too. Need a new dress for my brother’s wedding in August! these are so pretty and modest! I also signed up for their newsletter! Liked them on FB and signed up for the newsletter. I love these dresses, especially the floral print Christina. I would LOVE to wear the Christina dress to my cousin’s wedding in September. A play! We have season tickets and it is always fun to have a bit of a dress up. I will be wearing it EVERYWHERE! All styles are easy to dress down or dress up. it’s true, Amber. so versatile. Well, I might just wear such a pretty dress to work, or to church, or out to dinner with my husband. One never knows. I don’t have any special occasions lined up right now, except my anniversary in December. Love these dresses! I would wear one of these to work! and everywhere else. i would wear my new dress on vacation to hawaii! Love these dresses! I would wear mine to my sister’s graduation. I love the second dress. It has such a vintage feel. I would wear the dress to dinner to celebrate my husbands and mine 15 year wedding anniversary. Yay! Love the dresses! I’d wear one to my cousin’s wedding in August and just about anywhere else I could! I’d wear it for my White Coat Ceremony! I love both dresses. I have no idea where I will wear them but I have high hopes something will come around. I’d wear it to my friends’ college grad ! Oooh, I’d wear my new dress on a date with my husband to celebrate when he finishes taking the BAR exam! I would wear my new dress on a date with my husband! 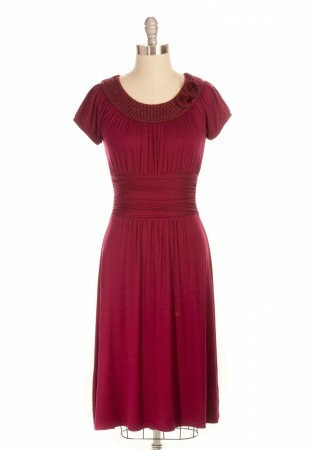 My oldest niece is getting married at the end of June…I really need a new dress, love the red one. Wow, such adorable dresses! Especially love the purple, so cute! Dinner! I would make my husband take me to dinner! :-) Thanks for hosting! I would wear my new dress to go to the Jim Gaffigan show this August in st. Pete’!! I’ve been looking for something cute and this is perfect! I liked them on FB! thanks! Love the “Madison” dress. I’d have to figure out somewhere fancy to go with my husband. Probably to one of the many weddings this summer! I’d bring mine on our big NYC trip! The Molly, Grace and Anne look like they would travel really well. Those dresses are pretty adorable, I’d wear mine to my birthday dinner next month. Oh,….I love the Anne dress. I would wear this to a wedding I am attending in June! Absolutely beautiful!! 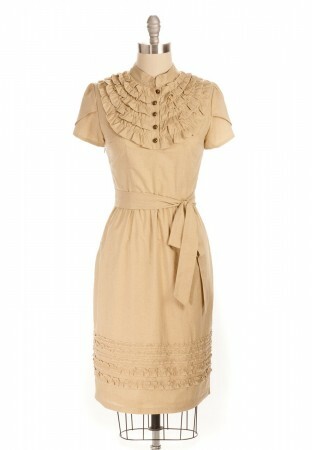 I love the Anne dress, and would wear it on a date with my husband for our 10 year anniversary in June. The Anne is beautiful, would love to wear this for cousins graduation! Love the tan dress! Definitely can see myself wearing it! I would wear one in my family picture we are having taken in july! probably many other places as well, thanks for the giveaway! I’d wear that Christina to work. i would wear it to an evening baseball game of course! I would wear the Jane this summer to my little brother’s rehearsal dinner. I would love to wear it to the wedding, but too close to white. It is beautiful! I would probably end up wearing it for date night with Manthing. With a black cuff bracelet. Yeah! My 25th wedding anniversary is coming up this summer, and I may be able to celebrate it by attending a friend’s wedding in Italy! I am definitely going to need a new dress….what perfect timing for your giveaway! thanks!!! I just moved close to Chicago, so a hot date with the hubby in the city would be nice! Definitely wear it out to a celebration lunch! Wearing it to my High School Reunion. i would wear this to my friends upcoming wedding! i Like William Riera on Facebook. I would be wearing it to one (or possibly all) of the weddings I am going to this summer! I need a new wardrobe ! I lost a lot of weight recently, which is great, but now nothing fits, however I’m too broke to replace it with quality clothes, haha. I’ll be wearing it to Sunday morning church service! Love those dresses. I’ve been on the hunt for one to wear to a friends wedding. Ooooo, I’d wear it to a beachside bistro in South Carolina this summer. My first vacation in yeeaaars! 2nd entry: Liked WR on FB. 3rd entry: Subscribed to newsletter. I would wear it to my friend’s wedding this summer! my family reunion this summer!! thanks! I would wear it to my baby’s blessing. I would love to wear a new dress to my sisters graduation! I’d wear a new dress out for a night on the town. I would wear one of these dresses everywhere! Love, love, love! The Grand America for brunch on my 51st bday! I would be wearing my dress on Catalina Island with my fiance! I am taking him back to the spot where he proposed almost a year ago to have a surprise party with his family flying in from Michigan. I have been looking for the ideal dress and LOVE some on William Riera!! I have done all the “extra” entrys too! I hope I get it! I’d wear it on my holiday next month. I would wear the dress on any ol’ day, I have nowhere fancy or special to go, I just like dresses and love getting dressed up! Love their dresses. I think the grace would be great for a night out with my honey. I’d wear the Lily or Camilla to a family wedding this summer! Cute! I’d wear one of their gorgeous dresses on a date this summer to celebrate our 13th wedding anniversary! I like William Riera on FB. …and am already an e-mail subscriber to their newsletter. Thanks! I would love to win a new dress for church! I would wear this when I see my boyfriend. He’s currently deployed (Navy) and I can’t wait to be with him again! I will be wearing this to my birthday party at the Hobbit Restaurant on the 31st! Okay I may have to delay it until it arrives but I will wear it in my head! I would wear it when we go on vacation this summer -the San Juan islands! I would wear it to a date night with my husband. Starting at a wine bar. Maybe I could wear it to a fancy birthday dinner for me! My baby is graduating from kindergarten and I would love to wear a pretty new dress! I would save the dress for post prenancy and wear on my first date night! would love to win! how lovely and lady-like! a new dress is a great reason for a date night! I would wear one of the dresses to my best friends casual wedding in August! Oooh – I love these dresses! I would wear one to my cousin’s wedding next month- and feel fabulous in it, I’m sure! I would wear the black one Kimberly ordered for a night out for our 11th anniversary! I’d wear the dress to my baby’s blessing. Summer weddings! Love the dressese and your site! I’d wear it to my brother-in-law’s wedding this summer! I’d wear it to dinner for our 15th anniversary! you would rock that black dress. I’ll (hopefully) be wearing the Anne dress to an end-of-the-summer-just-the-beginning-of-fall Jazz in the Park concert in Milwaukee — it would pair deliciously with a lovely bottle of wine and some great music!